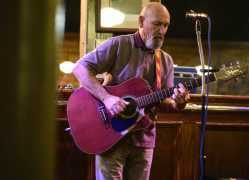 Bruce Zimmerman performs Tuesday during Songwriter's Night at Port Cape Girardeau. In a darkened room at Port Cape Girardeau on a Tuesday evening, songwriters sit with their instruments while a patient local musician listens and nods. 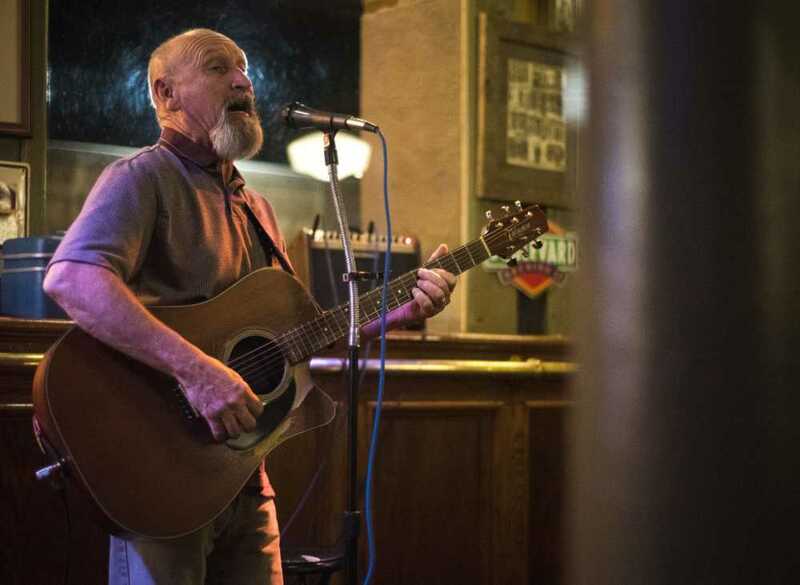 It's Songwriter's Night, which guitarist and songwriter Bruce Zimmerman said was started about two years ago to encourage songwriting in the area. "The only rule we have is no cover songs. It has to be original material," Zimmerman said. Songs may be any style or form, he added. "Doc at Port Cape has been good about providing a venue for it," Zimmerman said. "It's something I enjoy doing," he added. "It helps me, too, because it encourages me to write, myself. I don't want to just go down there every week and do the same songs. It inspires me a little bit, and it's been really nice to watch some of the regulars, how they grow and progress as writers." Besides that, he said, there's the input performers get from each other and the experience of watching each other. "Some are better at writing than performing," he said, "and some are good performers trying to work on their songs." There's no seniority at Songwriter's Night, Zimmerman said. Order is determined by a sign-up sheet, and if all songwriters play their allotted three songs before their three-hour time limit is up, they start over from the beginning, he added. Zimmerman said it's not about showing off. "We try to make it available to people at different talent levels," he said. "Otherwise, I think instead of encouraging people, you could discourage them. The only way I know how to do it is to be as fair as I can." 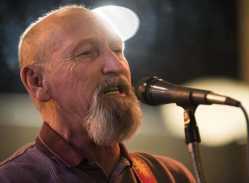 Zimmerman said he's been to other songwriter's nights, in Nashville, Tennessee, for example, and while he's loosely based this version on their rules, he acknowledged he has left off some of the things he didn't like. "Some of those are really controlled, and if one guy's better, he gets more. I wanted to avoid that," he said. "Not put a lot of limitations on it." Zimmerman said he's found ways to be around music all his life. "My father was a musician, so he showed me the basics, chords and things, when I was about 5 years old," Zimmerman said. He was in a band growing up in Bernie, Missouri, with his brother and cousins. "I haven't been out of a band since I was 9 years old," Zimmerman said, laughing. "I always played." By the time he was 20, he was on the road, playing, he said, but as time went on and he got older, he had a family, so he worked a lot of different jobs to supplement his income. But through it all, he never stopped playing. "I play now for the same reason that I did when I started: Because I just enjoy it," Zimmerman said. "But the longer you play and get better at your craft, the more joy you can have out of it because you've already put in all the work of learning and everything." It's not a simple matter of just picking up an instrument and taking off with it, Zimmerman said. "It takes hours and hours and years and years of dedication," he said. But it also takes love of the process, he said, and for him, a sense of duty to the audience and wholeheartedness. "I've always been serious about how I was perceived by my audience. I never want to go out and sound bad. I've always been that way," he said. "I wanted to do the best job I possibly could, so I still try to take that to every time I play." So what kind of music really draws him in? What calls to him when he plays? It's nothing in particular, he said, but it's everything, too. "There are a lot of different styles that really can reach me and move me, and when I write a song, I never sit down and say, 'Well, I'm gonna write a rock 'n' roll song or a jazz song.' Whatever influence seems to want to come out that day is what I write," he said. He's recorded one album, he said, and he's working on another but doesn't have a release date. He's still in the mixing phase with it, he said. 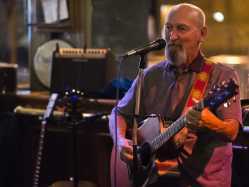 Zimmerman started playing guitar in 1956, and music has changed significantly since that time. "I had been playing in bands for a few years when the Beatles came out on 'Ed Sullivan' and music changed all across the West," he said. "It was always changing." And he's tried to change with it, he said, although the years on the circuit have taken their toll. It's most noticeable in one respect: his hearing. "I play a lot of wineries now," he said. "I still have a band, a full band, and we do play at the casino and different places, private events, that sort of thing, but I do a lot more solo and duo things than I do with the band anymore." He said the smaller venues and acoustic sets are better on his ears. "For years, I was playing six nights a week in bands, small clubs, with a cymbal in my ear." Zimmerman said he's had tinnitus for years. "I still love to crank up an electric guitar and let her scream," he said. "There's something about the feel of all that energy and drive that I would really miss if I didn't ever get to do it again, though." 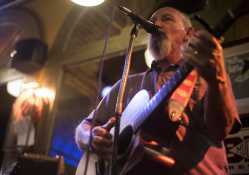 He's played during the dinner hour Fridays at Ciao in Cape Girardeau, too, he said, and several other venues here and there. It's easier now than it was in the days of creating media packets and calling people at venues, asking whether they wanted a musician to play, he said. With the internet and cellphones, it's much easier to get people. Part of that, too, is that he's more established now, and people have started to call him, he said. Larry and Jean Underberg of Underberg House Concerts recently have taken on some of his management needs, he added. "I have different events I'm playing in all the time, and I somehow just manage to keep working, keep playing. I always have, always found places to play." 19 N. Water St., Cape Girardeau, Mo. 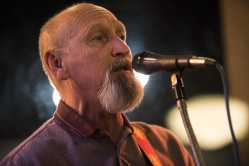 Bruce Zimmerman is a veteran bluesman and singer/songwriter who has been captivating audiences for decades. Since picking up a guitar at age five, Bruce’s journey has taken him from a first recording session at the famous Sun Studios, though tours that have included 6 countries and 28 states, to a 26 year stint fronting the house band at Port Cape Girardeau. Bruce’s career has seen him share the stage with Rufus Thomas, Lee Oskar (War), Kimberley Dahme (Boston), and “Skunk” Baxter (Doobie Brothers), to name only a few. Called “the legend,” the “elder statesman of the blues,” and “a guitar player’s guitar player” by the media, Bruce has much to offer his listeners, including the chance to hear blues played by someone who has actually chopped cotton. A half century of musical experience makes him a virtual musical encyclopedia, at home in a variety of genres. Years on the road find full expression in compelling original compositions that have made him a truly unique singer/songwriter. This accomplished vocalist has long since given up trying to sound like anyone other than Bruce, much to the delight of his audiences. For more information on Bruce Zimmerman, see www.BruceZimmerman.net. Call Larry at 573-270-1009 or email houseconcerts@hotmail.com for booking information. Bruce is available as a solo act, duo, or as part of a full band.